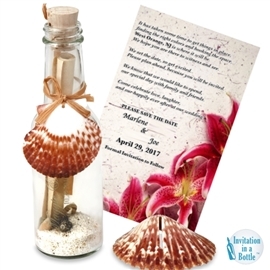 Message In A Bottle Invitations: Thinking Of Some Amazing Wine Bottle Wedding Invitation Ideas? Thinking Of Some Amazing Wine Bottle Wedding Invitation Ideas? Are you thinking of an amazing gift that you would like to present your guests at your wedding? What about a wine bottle with a personalised invitation tag? You can decide upon the theme of your wadding and then design wine bottle invitations which get matched to your unique wedding theme. wedding card could open out just like a wine list. A beautiful ribbon can also be tied to the front cover of the invite to make it look perfect. For designing green wedding invitations, you can use recycled wine bottle and you can place an invitation card inside it. The wine bottles can be personalised with a message from the wedding couple and you can use these wine bottle invitations as a wedding gift presented to your guests. You can put a handwritten message or your signatures can also be included to make the invitation more personal. Print the date of the wedding and the names of the label as well. There are many unique and eye-catching wine bottles invitations that are just hard to miss out. Instead of the usual labels, you can just fill in your personalised message and can explore your creativity to make your wedding invitation as extraordinary as possible. You can keep the design simple with an elegant card or can design a trendy card with pocket folds. Another idea is to put the monograms of you and your partner’s initial, pictures, quotes written by you or some symbols could be added that reflect your personalities. The more unforgettable your wine bottle invitations will be the more your wedding guests will appreciate your efforts.